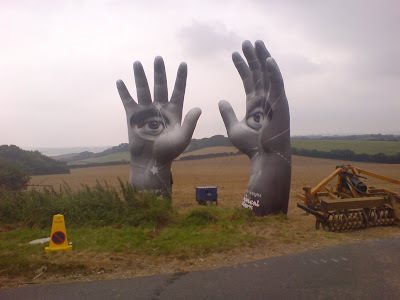 Hattie and Fern were at Bestival last weekend, where this pair of giant inflatable hands were photographed, promoting the new Chemical Brothers album. They looked rather stunning, standing magically in a ploughed field at the side of the 2hr traffic tailback to the main entrance. There really wasn't much to look at, but these certianly were 'eyecatching'.